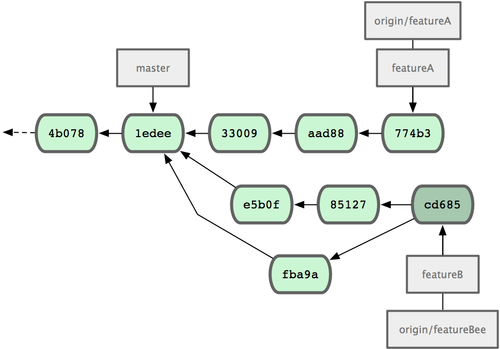 You know what the different workflows are, and you should have a pretty good grasp of fundamental Git usage. In this section, you’ll learn about a few common patterns for contributing to a project. The main difficulty with describing this process is that there are a huge number of variations on how it’s done. Because Git is very flexible, people can and do work together many ways, and it’s problematic to describe how you should contribute to a project — every project is a bit different. Some of the variables involved are active contributor size, chosen workflow, your commit access, and possibly the external contribution method. The first variable is active contributor size. How many users are actively contributing code to this project, and how often? In many instances, you’ll have two or three developers with a few commits a day, or possibly less for somewhat dormant projects. For really large companies or projects, the number of developers could be in the thousands, with dozens or even hundreds of patches coming in each day. This is important because with more and more developers, you run into more issues with making sure your code applies cleanly or can be easily merged. Changes you submit may be rendered obsolete or severely broken by work that is merged in while you were working or while your changes were waiting to be approved or applied. How can you keep your code consistently up to date and your patches valid? The next issue is your commit access. The workflow required in order to contribute to a project is much different if you have write access to the project than if you don’t. If you don’t have write access, how does the project prefer to accept contributed work? Does it even have a policy? How much work are you contributing at a time? How often do you contribute? All these questions can affect how you contribute effectively to a project and what workflows are preferred or available to you. I’ll cover aspects of each of these in a series of use cases, moving from simple to more complex; you should be able to construct the specific workflows you need in practice from these examples. Before you start looking at the specific use cases, here’s a quick note about commit messages. Having a good guideline for creating commits and sticking to it makes working with Git and collaborating with others a lot easier. The Git project provides a document that lays out a number of good tips for creating commits from which to submit patches — you can read it in the Git source code in the Documentation/SubmittingPatches file. Next, try to make each commit a logically separate changeset. If you can, try to make your changes digestible — don’t code for a whole weekend on five different issues and then submit them all as one massive commit on Monday. Even if you don’t commit during the weekend, use the staging area on Monday to split your work into at least one commit per issue, with a useful message per commit. If some of the changes modify the same file, try to use git add --patch to partially stage files (covered in detail in Chapter 6). The project snapshot at the tip of the branch is identical whether you do one commit or five, as long as all the changes are added at some point, so try to make things easier on your fellow developers when they have to review your changes. This approach also makes it easier to pull out or revert one of the changesets if you need to later. 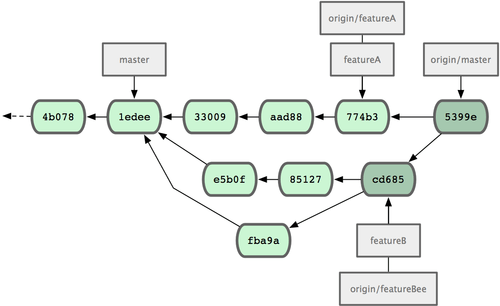 Chapter 6 describes a number of useful Git tricks for rewriting history and interactively staging files — use these tools to help craft a clean and understandable history. If all your commit messages look like this, things will be a lot easier for you and the developers you work with. The Git project has well-formatted commit messages — I encourage you to run git log --no-merges there to see what a nicely formatted project-commit history looks like. In the following examples, and throughout most of this book, for the sake of brevity I don’t format messages nicely like this; instead, I use the -m option to git commit. Do as I say, not as I do. The simplest setup you’re likely to encounter is a private project with one or two other developers. By private, I mean closed source — not read-accessible to the outside world. You and the other developers all have push access to the repository. At this point, John’s local repository looks something like Figure 5-4. Figure 5-4. John’s initial repository. 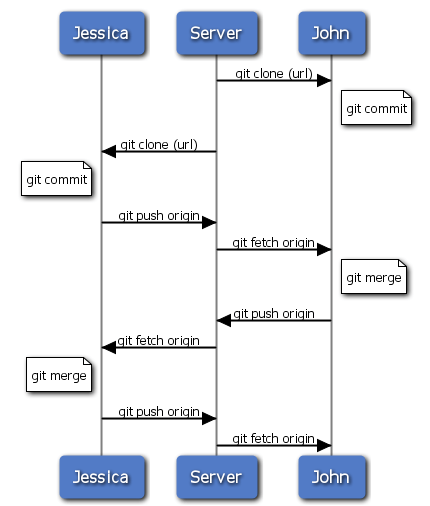 The merge goes smoothly — John’s commit history now looks like Figure 5-5. Figure 5-5. John’s repository after merging origin/master. Finally, John’s commit history looks like Figure 5-6. Figure 5-6. John’s history after pushing to the origin server. In the meantime, Jessica has been working on a topic branch. She’s created a topic branch called issue54 and done three commits on that branch. She hasn’t fetched John’s changes yet, so her commit history looks like Figure 5-7. Figure 5-7. Jessica’s initial commit history. That pulls down the work John has pushed up in the meantime. Jessica’s history now looks like Figure 5-8. Figure 5-8. Jessica’s history after fetching John’s changes. 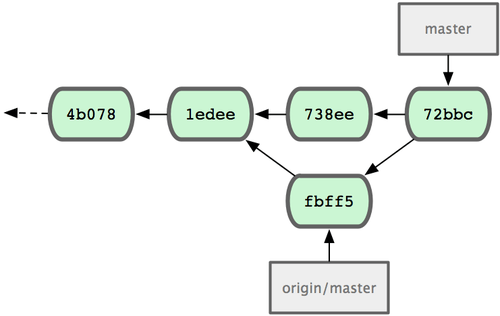 Your branch is behind &apos;origin/master&apos; by 2 commits, and can be fast-forwarded. Everything merges cleanly, and Jessica’s history looks like Figure 5-9. Figure 5-9. Jessica’s history after merging John’s changes. Each developer has committed a few times and merged each other’s work successfully; see Figure 5-10. Figure 5-10. Jessica’s history after pushing all changes back to the server. That is one of the simplest workflows. 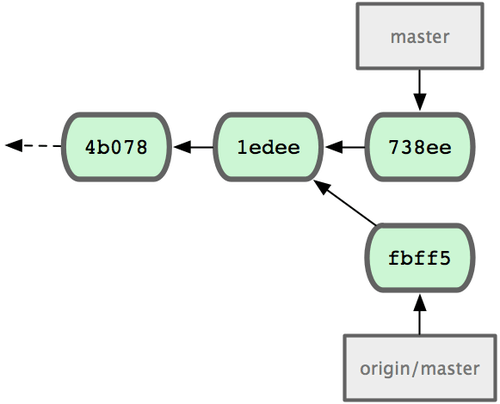 You work for a while, generally in a topic branch, and merge into your master branch when it’s ready to be integrated. When you want to share that work, you merge it into your own master branch, then fetch and merge origin/master if it has changed, and finally push to the master branch on the server. The general sequence is something like that shown in Figure 5-11. Figure 5-11. 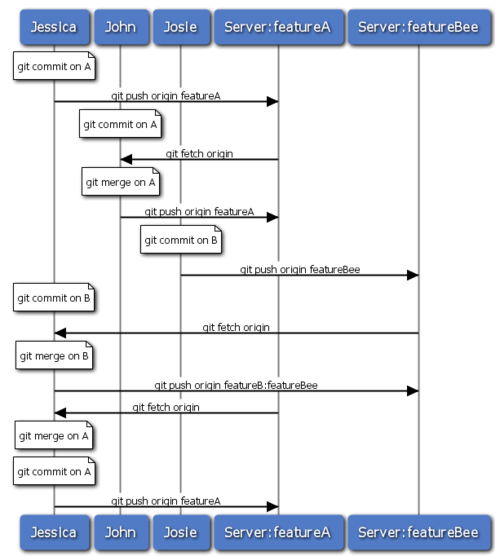 General sequence of events for a simple multiple-developer Git workflow. In this next scenario, you’ll look at contributor roles in a larger private group. You’ll learn how to work in an environment where small groups collaborate on features and then those team-based contributions are integrated by another party. Let’s say that John and Jessica are working together on one feature, while Jessica and Josie are working on a second. In this case, the company is using a type of integration-manager workflow where the work of the individual groups is integrated only by certain engineers, and the master branch of the main repo can be updated only by those engineers. In this scenario, all work is done in team-based branches and pulled together by the integrators later. Jessica’s repository looks like Figure 5-12. Figure 5-12. Jessica’s initial commit history. This is called a refspec. See Chapter 9 for a more detailed discussion of Git refspecs and different things you can do with them. Jessica’s commit history now looks something like Figure 5-13. Figure 5-13. Jessica’s history after committing on a feature branch. Jessica, Josie, and John inform the integrators that the featureA and featureBee branches on the server are ready for integration into the mainline. 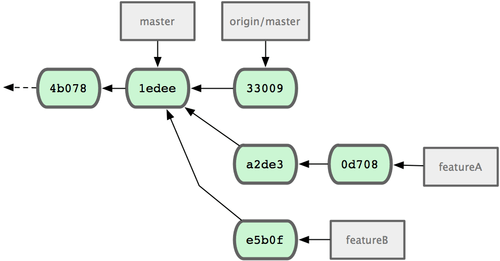 After they integrate these branches into the mainline, a fetch will bring down the new merge commits, making the commit history look like Figure 5-14. Figure 5-14. Jessica’s history after merging both her topic branches. Many groups switch to Git because of this ability to have multiple teams working in parallel, merging the different lines of work late in the process. The ability of smaller subgroups of a team to collaborate via remote branches without necessarily having to involve or impede the entire team is a huge benefit of Git. The sequence for the workflow you saw here is something like Figure 5-15. Figure 5-15. Basic sequence of this managed-team workflow. Contributing to public projects is a bit different. Because you don’t have the permissions to directly update branches on the project, you have to get the work to the maintainers some other way. This first example describes contributing via forking on Git hosts that support easy forking. The repo.or.cz and GitHub hosting sites both support this, and many project maintainers expect this style of contribution. The next section deals with projects that prefer to accept contributed patches via e-mail. You may want to use rebase -i to squash your work down to a single commit, or rearrange the work in the commits to make the patch easier for the maintainer to review — see Chapter 6 for more information about interactive rebasing. When your work has been pushed up to your fork, you need to notify the maintainer. This is often called a pull request, and you can either generate it via the website — GitHub has a "pull request" button that automatically messages the maintainer — or run the git request-pull command and e-mail the output to the project maintainer manually. The output can be sent to the maintainer—it tells them where the work was branched from, summarizes the commits, and tells where to pull this work from. Now, each of your topics is contained within a silo — similar to a patch queue — that you can rewrite, rebase, and modify without the topics interfering or interdepending on each other as in Figure 5-16. Figure 5-16. Initial commit history with featureB work. This rewrites your history to now look like Figure 5-17. Figure 5-17. Commit history after featureA work. The --squash option takes all the work on the merged branch and squashes it into one non-merge commit on top of the branch you’re on. The --no-commit option tells Git not to automatically record a commit. This allows you to introduce all the changes from another branch and then make more changes before recording the new commit. Now you can send the maintainer a message that you’ve made the requested changes and they can find those changes in your featureBv2 branch (see Figure 5-18). Figure 5-18. Commit history after featureBv2 work. Many larger projects have established procedures for accepting patches — you’ll need to check the specific rules for each project, because they will differ. However, many larger public projects accept patches via a developer mailing list, so I’ll go over an example of that now. You can also edit these patch files to add more information for the e-mail list that you don’t want to show up in the commit message. If you add text between the --- line and the beginning of the patch (the lib/simplegit.rb line), then developers can read it; but applying the patch excludes it. To e-mail this to a mailing list, you can either paste the file into your e-mail program or send it via a command-line program. Pasting the text often causes formatting issues, especially with "smarter" clients that don’t preserve newlines and other whitespace appropriately. Luckily, Git provides a tool to help you send properly formatted patches via IMAP, which may be easier for you. I’ll demonstrate how to send a patch via Gmail, which happens to be the e-mail agent I use; you can read detailed instructions for a number of mail programs at the end of the aforementioned Documentation/SubmittingPatches file in the Git source code. 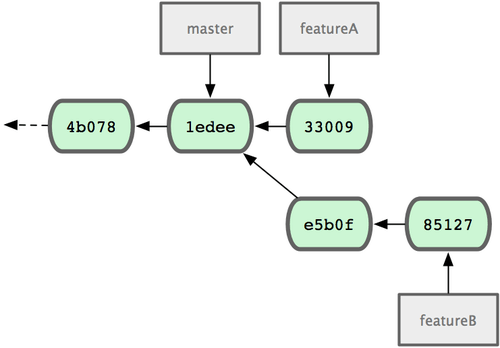 This section has covered a number of common workflows for dealing with several very different types of Git projects you’re likely to encounter and introduced a couple of new tools to help you manage this process. Next, you’ll see how to work the other side of the coin: maintaining a Git project. You’ll learn how to be a benevolent dictator or integration manager.